Today we are talking about Barack Obama. He first took office in 2009 and was re-elected in 2012. Because his presidency is so recent, this program will not try to offer a historical perspective. But one part of his legacy is already clear. 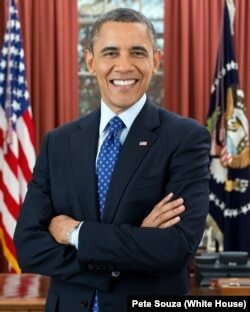 Obama is the United States’ first African-American president. His father was a black man from Kenya; his mother was a white American from the Midwestern state of Kansas. For many Americans, Obama’s presidency was an important symbol in a country that permitted black people to be enslaved. And, even after the U.S. Constitution officially banned slavery in 1865, African-Americans have been extremely under-represented in the U.S. government. By 2009, only five African-Americans had ever served in the U.S. Senate – and Obama was one of them. Even many people who did not vote for Obama said his election to the country’s highest office made them proud or hopeful. A public opinion survey immediately after Election Day found that two-thirds of Americans believed that the country’s racial conflicts could be resolved. Obama’s parents met as students at the University of Hawaii. His father had won a scholarship to study economics. His mother went on to earn a degree in math there, as well as a graduate degree. The two married and had a son, whom they named after his father: Barack Hussein Obama, Jr. But the couple soon separated. The older Barack Obama returned to Kenya, where he later died in a car accident. Barack’s mother went on to marry another man. He was from Indonesia. The family moved to Jakarta, and the couple had a daughter named Maya. 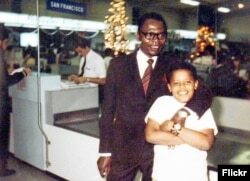 When Barack was 10, his mother sent him back to Hawaii to live with her parents. She wanted him to get a good education. Barack finished high school in Hawaii, then went on to Occidental College in Los Angeles. After two years, he transferred to Columbia University in New York. There, he completed a degree in political science. But Obama said the best education he received was in one of his first jobs. 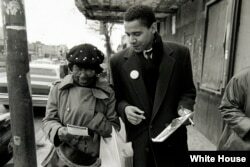 He worked as a community organizer in Chicago. He helped people who lived in public housing put pressure on the city government to improve their conditions. Obama later said the work showed him how important it was to understand the legal process. So he entered Harvard Law School. Over the next years, Obama worked as a lawyer, wrote a book about his experience as a person of mixed race, and married Michelle Robinson, a woman he worked with at a law firm. She and Barack Obama settled in Chicago and had two daughters, Malia and Sasha. When he was in his mid-30s, Obama began his political career. He was elected three times to the Illinois state senate. After 10 years there, he won a seat in the U.S. Senate in a landslide victory. That same year, Obama attended the Democratic National Convention – the meeting where the party officially nominates a presidential candidate. Obama was not one of the candidates. But the Democrats asked him to make an important speech. In it, Obama famously talked about how his life story was an American story. He said he was confident the U.S. could overcome its divisions and achieve unity. Only four years later, Obama would be elected its 44th president. Kelly Jean Kelly wrote this story for Learning English. Hai Do was the editor. See how well you understand the story by taking this listening quiz. Play each video, then choose the best answer.